Supermarkets across the nation are joining together to implement a program to counteract childhood obesity. Produce sections now include baskets of fresh fruit that are free to children who are often hungry and more likely to choose less nutritious snacks that are high in fat, salt, sugar, and calories. One in three children in America are now considered to be overweight and obese. 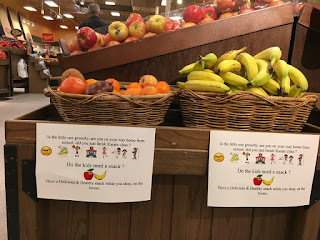 Offering “Fresh Fruits for Kids” is a great way to encourage our children to eat healthier and it is a way to distract them away from begging for that junk food. The National Nursing Network Organization thanks all participating grocery stores and sees this as an example of what can be promoted via a National Nurse for Public Health.